Amit Kothari and Pravina Pindoria are the husband and wife team behind Tallyfy. This tech start-up was founded in London and has just returned from seven months in Chile, where the company had relocated, after being awarded government funding from the Start-Up Chile program. Tallyfy, in final pre-launch stages, is reminiscent of the purest forms of tech start-up, as it provides a simple solution to a recurring business problem through marrying smart coding with common sense. We caught up with Amit in London to find out about their experiences with Start-Up Chile, talk grassroots tech in the country and find out what’s next for Tallyfy. I’ll start with the general nature of the program in Chile. It was started by, or initially inspired by a guy called Vivek Wadhwa - with others behind the movement as well. He pushed the Chilean government to create a program that funded micro sums of money to people who had ideas. The alternative that the government proposed was to create science parks and industrial parks with grants given to large companies to locate their headquarters and research facilities in Santiago. Now he made the argument that the funds were so small here to every start-up that even if [only] one became a $10milliion company, it would be a vast benefit to Chile. Far more so than handing out grants for big companies to come to Chile. And in a way they would just be exploiting the fact that they had the grants rather than actually contributing back to the Chilean economy, you know, in R&D and innovation. The program wants to build an ecosystem something like Silicon Valley, but in a Chilean sense. It certainly sounds like an inspirational program, how did Tallyfy most benefit? We used the program to connect to a whole bunch of other companies. Beyond Start-Up Chile there are corporations that support Start-Up Chile’s participants. One or two are quite visionary. There’s BBVA which is a Spanish bank that is public about being innovation-led. They hold things like innovation days where they make it a first port of call to invite Start-Up Chile participants. For many companies, after the Start-Up Chile program, there’s an incubator called Wayra which is active across the Spanish-speaking world, run by Telefonica. [This] funds promising companies after Start-Up Chile. So for some companies, Start-Up Chile acts as the first step; it [offers] roughly $40k in about six months. Then if you apply to Wayra you give up equity, but you get another $50k according to its own program. In a way the maturing nature of a company would lead it down that path and then you could really attack South American markets. But it should be stressed that the start-ups are often extremely early stage and for Tallyfy, we were really just a concept. There was nothing on the drawing board for Tallyfy, we just pitched a concept, and we built the concept while we were on the program. So Start-Up Chile was a major catalyst for the development of Tallyfy, is this the case for the majority of companies involved in the program? I think there were some that we knew that came with an already finished product and they used the funding to deepen their access to the market. Effectively they used their funding for marketing, which in most cases is the best return for any kind of money if you choose to spend it right. I must mention that it’s for social enterprises too, not just commercially oriented start-ups. The program is especially interested in enterprises which have measurable impact on Chilean problems. So it’s very diverse across the board. Did you and Pravina have the chance to give back to Chile in the program? One of the most important elements of the Start-Up Chile program is understanding the social impact activities you have to do, measured by RVA points. RVA stands for Return Value Agenda so in return for their money you promise to give back to the Chilean economy. Now, what that give-back actually manifests itself, in our case, was university lectures, talks, where we went to meet local students and share our experiences in starting a company, inspiring them, and being inspired in return by people with ideas and skill. So, evangelising the message and for every one of these things you do, you accrue RVA points. The funding in the first round doesn’t get released until you’ve accrued a certain number of points for social impact. How did this part of the program help you with developing Tallyfy? Tallyfy is a tool that allows you to make processes very simple. We break any process down into a checklist and you can distribute that amongst a team to enable businesses to get things done quickly and efficiently, on any device, updating in real-time. This basic idea was really different in the beginning. We honed it down with a lot of conversations and help from actual potential users. And I think what we learned is just to listen more, to every piece of feedback. Often when you start something new, I think you’re so married to an idea that you fail to see anything else beyond that idea. And you especially fail to twist and turn that idea into what your customer actually needs. So I think there has to be a good mix. We learned a good mix of idealism and actually making sure this is a product that people will buy. We only finished building it when we left Chile, because it took a long time to build, but in the meanwhile, we have partnered with many consultancies and know many companies already in Chile and we just have to complete our product, which will be in a few weeks from now. We will then launch it so customers can start using it effectively. So we have a large waiting audience, in Chile and outside of Chile. We can’t wait to launch Tallyfy. I think we learned about ourselves in Chile, we learned how to question ourselves, we learned not to have confirmation bias about our ideas and about what we wanted to do. So that was a challenge, for somebody who really believes in their idea, for that person to change that idea completely. Only a certain kind of person will be able to give in and say this may or may not work this way, and to change it. So I think that’s the toughest battle, in the beginning of an idea. 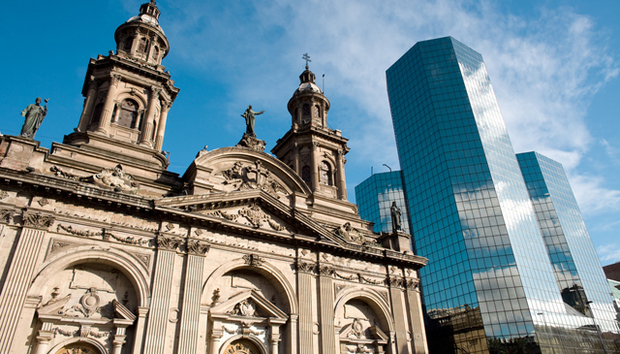 How did you find the environment in Santiago? Santiago is a fantastic city. We stayed in an area called Providencia which was a lovely community. We didn’t have long to walk to CMI (Centro Movistar Innova) which is the co-working space that all Start-Up Chile participants share, near the city centre. It was excellent and I do miss certain things about Santiago like empanadas, certain restaurants and lots of other places. And I know that we’ll go back for sure. Whether for business or pleasure, we’ll go back to Chile. And what was your fondest experience of the grass roots start-up environment in Chile? We went down to Puerto Montt and Puerto Varas, a beautiful area in the south of Chile. It’s a green lovely part of the world which is called “Los Lagos”. We went there to give a presentation to a group of entrepreneurs who used a shared space as an incubator for start-ups. The shared space was modest - used by people to set up offices and to network. We were invited to talk there about our experiences. In this case it was to talk about our wedding newspaper business, Momento Services. Everybody who attended came with open eyes and sparkling enthusiasm, so much so that the Q&A session afterwards lasted much longer than the actual talk did. Everyone there was part of the fishing-dominated local community, so people’s ideas were all related to their knowledge of the local economy. They were keen to develop their ideas and build businesses that would enable them to expand their horizons. We talked to them about brand positioning, what makes something unique, what makes something hard to copy and so on. And I think they found it insightful. I’ve never seen this much enthusiasm before for this kind of conversation. These are the raw roots of entrepreneurship in Chile. We were lucky enough to be the people who had the honour of talking to these people - to leave with a shared idea that “we can all make it”. And I hope that they make it in whatever ventures they decide to do. Maybe you will read about it, in an article just like this one - in years to come. In general, I found Chile to be a beautiful country in every way, with huge capacity– both human and material. I want to believe that Chile is in the renaissance of something incredible. Now it comes down to navigating the path to that future. The early seeds have been sown, and they are growing very successfully. David Lee is a business and technology journalist working in emerging economies.